The 13 Best Pipes for Weed That Don't Break The Bank! I think it’s safe to say we all love smoking weed. And pipes have long been a favorite among cannabis consumers because of their portability, durability and they also help tone down the smell. If you’re looking to grab one, you’ll want to keep reading to see what we chose as the best pipes. Say what you will about Grav Labs glass, 9/10 time their pieces are badass. What better to top our list then the classic Grav Labs Sherlock? The pipe is crazy affordable without sacrificing quality a bit. It’s a surprisingly big piece (6”), and it’s 32mm thick. Thanks to the ancient design, you never have to worry about inhaling pieces of weed or ash, and you can get it in your favorite color. The design can make it a little difficult to clean, but I say that’s a small price to pay for what you get with this pipe. It's thickness, price and design make it the best pipe to smoke weed with. You'll experience the best high of your life with this glass! I must admit, this finds itself on this list in large part to my lifelong love of Dragon Ball Z. But, it’s a lot more than just one of the coolest weed pipes. Heady glass is what Empire Glassworks have built their empire on, and they pulled all the stops out for this Shenron inspired Dragon Sphere Pipe. It’s a little more than you’d want to spend if you plan to have with you on the go everywhere. Empire blows all their glass in America from a high-grade scientific glass. Once you get this in your hand, you’ll notice how thick and heavy it is. It feels like you’re holding some awesome glass in your hand. At 5” in length, this thing rips. If you like this Empire, you will love their bong collection so check it out! As you’ll come to find out, Grav Labs makes a lot of the best marijuana pipes you'll come across, and this list will be littered with their pieces. This one right here is their simple doughnut spoon. Nothing fancy here at all, yet it’s one of the smoothest hitting pipes on this list. It’s named after the circle design in the stem of the pipe. This circle works as an ash catcher by blocking them. The design shows that Grav is thinking about the smoker when they are engineering their glass. It is 4” long, and you can get it in 10 different colors. This is as ethereal as a pipe gets. 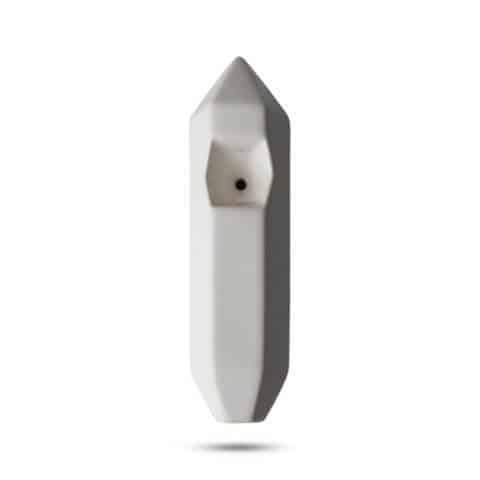 It’s a beautifully made to look like a crystal, instead it’s a ceramic pipe that’s made from a Made from lead-free glaze. It's small and fits easily into your pocket—but at 4” long it’s still easy to hit. If you’re looking for glass that looks like an actual crystal, you can buy a pipe made out of real rose quartz. Going with a ceramic version creates a more pristine vibe. It is a lot more than most, but that’s what you can expect from pipes made in California. Now, I promise there are more than just Grav Lab pipes on this list! 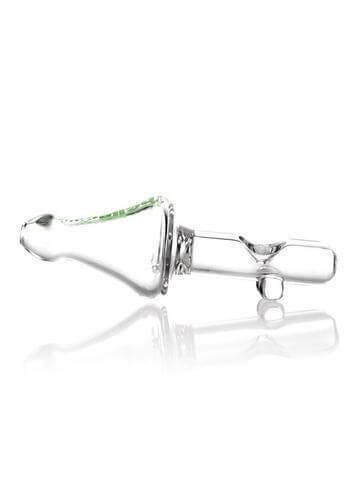 This is one of the few pipes that you can pick up in a couple of different sizes. 6 to 7 inches makes a huge difference in the size of the bowl. What makes this pipe so special, though, is it’s Venturi chamber. 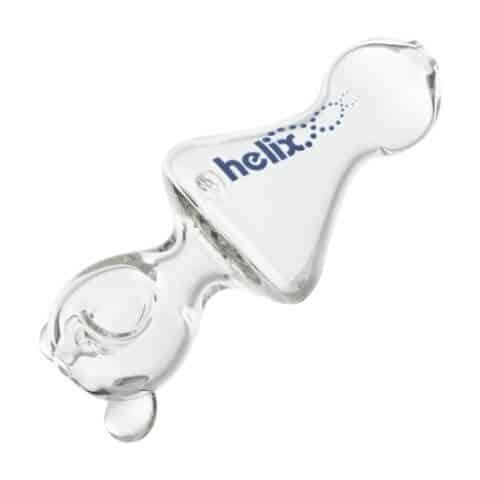 There is seriously nothing else like it, and it’s what the entire Helix brand is built upon. It creates a vortex with the smoke that dramatically reduces the smokes temperature on its way through the pipe. This makes it one of the smoothest hitting bowls, allowing you to take huge rips. The reason this one isn’t higher on the list is its price. You definitely pay for the quality on this one. Purr glass is not normally known for their hand pipes—it’s their awesome bongs that make everyone love them. This little beast is as good as it gets, though. It’s only 3 ½” long, but it's THICK. Made in California, this pipe is available in 7 colors. Then you can you afford to not pick up this Gandalf? Available in five different colors and two different sizes, you can get one that you’ll fall in love with. UPC blows this out of high-quality scientific glass. 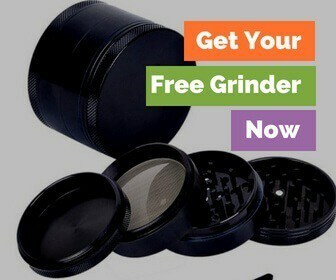 They gave it a huge/deep bowl, so be prepared to stuff a ton of weed in it. If you want something you can pass around and have fun with friends, this is the best pipe for you. It’s block feet make it easy to stand up straight, and it’s American made glass. UPC also have a great bong collection. I’ve always been a fan of more heady pieces, and have loved the work of Chameleon. A firm believer in American blown glass, and supporting smaller artists, Chameleon is a brand you can trust. This 4” pipe is playing off the pop culture phenomena, The Night Before Christmas. It also has a very deep bowl, which makes it a good pipe to share bowls with friends. This is the last Grav I promise! It’s a steamroller with the same Helix vortex as the one earlier, so you know your hits are going to be smooth. The biggest difference between the two is where the carb is. As with any steamroller, the carb is located at the front of the pipe, and you close it with your pointer finger instead of your thumb. The hole is also bigger, so you’re able to bring more air into your lungs with your draw. You can only get it in one size, though, which is 6”. 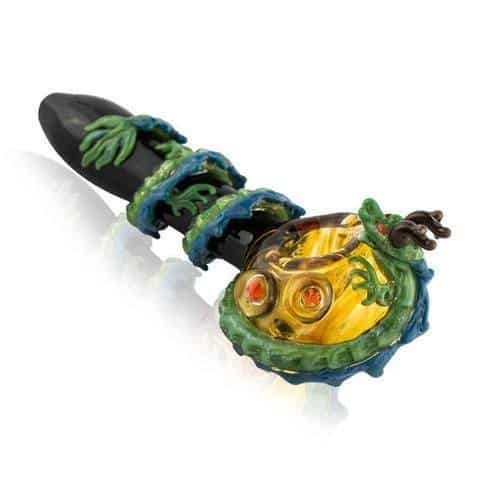 Another awesome pipe from Chameleon, this pipe is inspired by Alice in Wonderland's, Cheshire Cat. And, boy do they nail it. Blown in Arizona, like all their glass, this pipe also glows in the dark. For such a heady piece, you’d expect the price tag to be a lot steeper then it is. It’s got a deep bowl, and the attention to detail is amazing. Not anything you can say to knock it. Another brand that we love here, Sesh Supply puts out extreme quality without the high-end price tag. 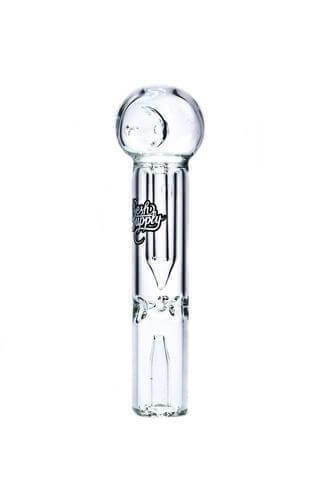 In my opinion, Sesh Supply has some of the best percs out there, and they took that technology to this hand pipe. The Theseus Spoon is both a spoon and a bubbler. The design is like nothing you’ve ever seen and makes it easily the smoothest hitting pipe there is. It has a spill-proof internal chamber that prevents the water from ever coming close to your mouth. And it’s known as one of the smoothing hitting pipes because of how cool the smoke is thanks to the water. At 6” long, this hybrid is a beast. I just love the design of this pipe! 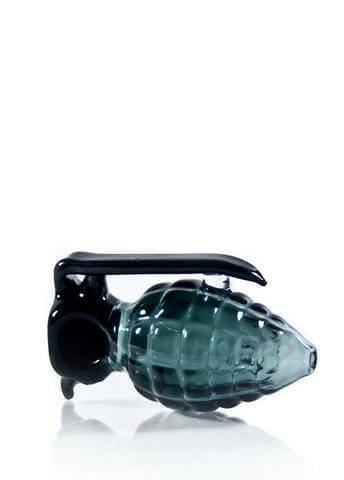 It’s from Dank Geeks own line of glass (who is one of the top online headshops and is blown to look like a grenade. 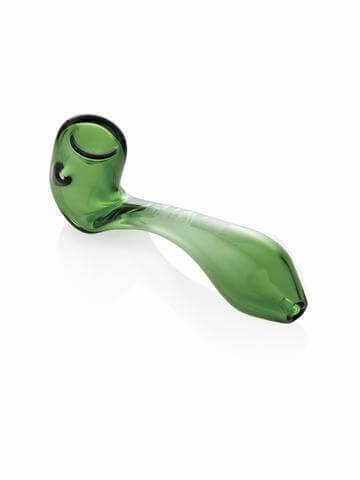 At 4” long, this pipe is the perfect size to fit in your hands, and the shape makes it comfortable to hit. The bowl is deep and made of thick borosilicate glass, but I mainly just love it for the look. You will also want to pop in to see all of the accessories that Dank Geek has to offer to pair with your new glass. I wanted to throw this in here to show you that even the most basic colored and fumed spoons that you can get are great pieces. Most of what you’ll find at your local headshop is glass like this. Either blown from local artists or just no-named pipes that you can basically pick based on their aesthetic appeal. While it may not be one of the "best weed pipes," they do the job just fine. Fumed glass means that it will change colors as you smoke from it, and this particular one is hand blown in America. This is just 13 pipes out of tens of thousands of glass pipes design. These may be what I think are the 13 best weed pipes, but what’s your opinion? I’d love to hear about it, or if you’ve hit any of these, then I'd love to hear your thoughts on them. Even better, do you have suggestions for the best weed pipes? Let’s smoke about it in the comments below!